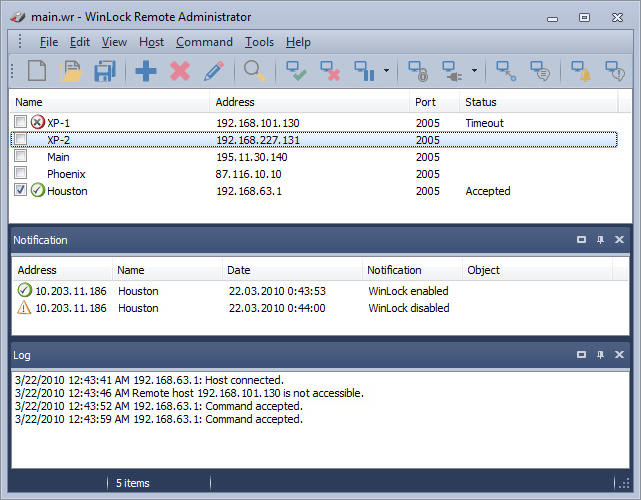 WinLock Remote Administrator the centralized remote management and monitoring security solution for Windows networks. It helps quickly configure remote WinLock and WinLock Professional clients via network lock remote workstations user activities and apply security profiles by means of easy-to-use interface. 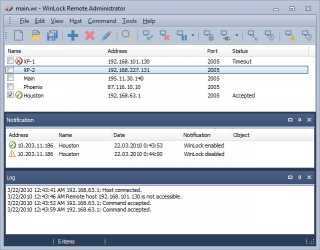 Being a client-server application Remote Administrator allows the administrator to control the network installations of WinLock without leaving the computer. By means of this tool you can manage WinLock settings on-the-fly enable or disable each copy of WinLock separately pause protection and send pop-up messages shutdown lock or reboot the remote computer view and record user activities scan network for active WinLock clients capture screenshots of remote clients desktop run programs on remote clients and more.. Export to .csv.Change password command.Remote lock and unlock.Support for Instant Lock.Column sorting.Calculate broadcast IP for all available networks.